General – school and class rules, voting on class issues, school council, behaviour systems, certificates etc. Assemblies focus on moral themes each term, with weekly assemblies led by members of local churches. Paired work, group work from day one in school, taking turns, sharing, tolerance, support, respect, care are all taught and modelled. The Play-pod at lunchtime provides children with further opportunities develop these in an informal setting. We have an implicit and explicit drive towards ‘doing the right thing’ which includes an expectation to say please and thank you, show consideration and awareness towards others which boils down to pupils being taught and being shown how to be empathetic people. We formalise this through roles and responsibilities. Year 6 have a vast array of ‘jobs’ to support the day to day running of the whole school, for example, seekers for lost property, office helpers, librarians and dinner hall helpers. Community links – Specific celebrations are shared and celebrated, from a religious and also a cultural standpoint such as Rosh Hashana, Chinese New Year, Diwali and Remembrance Day. Linked to this we hold international days, sometimes directly linked to topics, sometimes as standalone events, where languages, culture, similarities and differences are explored. Harvest, Christmas and many other charity support events (Children in Need, Comic Relief, Sports Relief, Barnados, Shelter, NSPCC, Bristol Children’s Hospital), showing how we impact the world around us and how we can help others in need. Visits from outside agencies, para-Olympian, guide dogs, those sharing their roles in the community / society such as fire and police service, a local MP, road and rail safety officers, animal handlers, people who are important to us and help us etc. Images and inspirational work displayed around school which positively address cultural, religious, race, disability, familial, gender and societal similarities and differences in a way that promotes understanding, empathy and unity. PSHE lessons to challenge stereotypes, reinforce rules (including of law), individuality, break down stereotypes including all mentioned above, respect and tolerance. Through our involvement in the Power of Reading project, we use a lot of very high quality picture books as part of our extended writing which also serve as triggers for PSHE discussions. The same can be said about RE lessons, where tolerance and understanding form a significant element of learning, made explicit in the curriculum where commonalities and uniqueness are explored between all major religions. 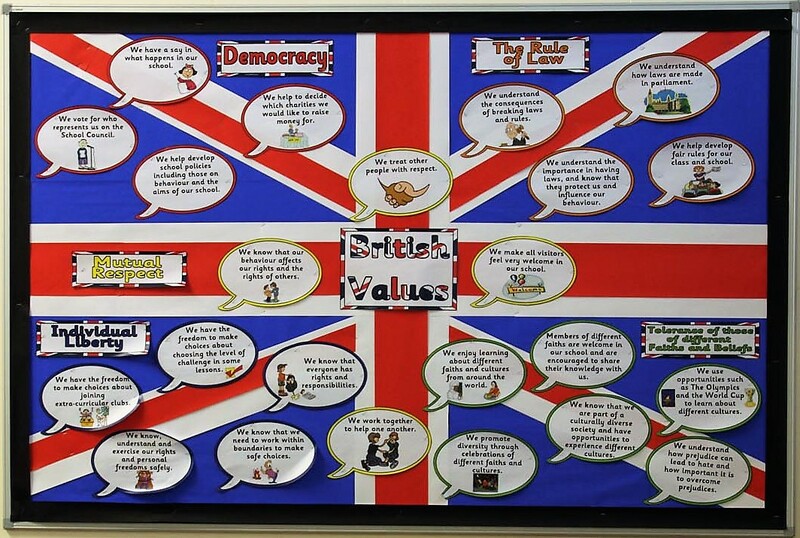 Examples are: learning about major religious beliefs and how they complement each other and have common values, termly explicit values taught through all assemblies, with the taught behaviours being rewarded through Proud to be Purple certificates and Newsletters (values such as respect, tolerance, love, hope, responsibility etc). History is at times used to explore contemporary issues as they affect pupils today through the lens of history, including relevant historical context is essential to understanding what it means to be a citizen of the UK today. Examples such as slavery and strata within society (Romans), class system, British History etc. Geography, understanding of local communities including developing pupils’ ideas of roles and responsibilities within in the community, break down of stereotypes through specific cultural topics (such as Tribes topic). Facilitation of pupils engaging in our local community e.g. through trips including to places of worship, visitors such as emergency services, councillors, dog fouling competition, engagement with annual summer fair and community festival. Further examples include charity work where we choose and explore charities and how we can make a difference. Early years where ‘About Me’ style learning and topics celebrate and recognise diversity. Child led learning in itself linking to choices, understanding of each other, personal responsibility, impact of actions etc. Respect features highly to support integrations of many pupils from any different pre-school environments, including some who have not been to any formal pre-schooling. Behaviour (and language) is consistently modelled (as it is across all school) and similarities and differences are actively promoted and celebrated. English – through the Power of Reading project, high quality text form the basis of much of our literacy work. These texts provide an opportunity to explore British culture, as well as issues within society as a whole. For example, friendship in Man on the Moon; British society in The London Eye Mystery; mutual respect in The Iron Man and human endeavour and courage in Ice Trap! Shackleton’s Incredible Expedition. Art and music – celebration of art in many cultures, unique interpretations of the same event / input, and to value others’ ideas and reflections, teamwork and listening skills. Through music, cultural and historical distinctiveness is learned about and celebrated. Behaviour policy which teaches boundaries, recognises pupils fulfilling expectation, rewards those who go above and beyond, and support pupils to improve if they do not live up to the expectation. This is highly successful in our school and creates the bedrock of the work our pupils undertake. Most importantly, this is all taught through and underlying belief of a desire to develop an understanding of shared school values (e.g. behavioural, moral and academic expectations), respecting each other and living within a school community as well as a wider community.